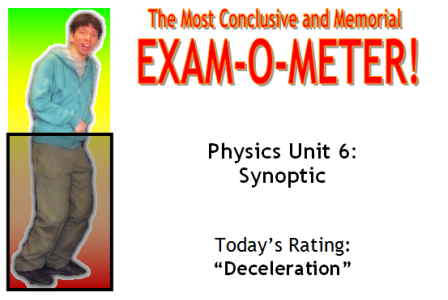 The Most Conclusive and Memorial Exam-O-Meter! This is probably the most arbitrary exam rating I’ve done of the lot: on the one hand, objectively, I probably didn’t do that well, all things considered. However, since I had pretty low expectations anyway – it’s Physics, not to mention the dreaded Synoptic unit – I actually rather enjoyed it, in a strange sort of way. I managed to show the units were homogeneous, for the very last time! And I also thought – yup, if things had gone differently, if Physics had been life-or-death for me, I could have done this ‘properly’, and that means something to me.